An analysis made by Europeans suggests and confirms a relationship between fruit and vegetable consumption and the risk of mortality. As confirmed earlier more consumption of fruits and vegetables reduces all kinds of mortality, specially cardiovascular disease mortality. Though this is not a new invention, it simply confirms their role in reducing the mortality rate. This analysis was recently published in the "American Journal of Epidemiology" was done by researcher from 10 different countries as a part of European Prospective Investigation into Cancer and Nutrition (EPIC). The sample that where under study, includes 25,682 deaths among the 451,151 participants studied for more than 13 years. "This study is the most significant epidemiological study that this association has examined to date. There is now sufficient evidence of the beneficial effect of fruit and vegetable consumption in the prevention of cancer and other chronic diseases. For this reason, one of the most effective preventative measures is promoting their consumption in the population," says Maria Jose Sanchez Perez, director of the Andalusian School of Public Health's (EASP) Granada Cancer Registry and one of the authors of the research, explains to SINC. According to the study, a mixed vegetable and fruit consumption of more than 569 g/day brings down the risk of mortality by 10% and delays the risk of mortality by 1.12 years, when compared to a consumption of less than 249 g/day. If there is a 200 g increase in the daily fruit and vegetable consumption, the risk falls by 6%. A balanced diet rich in fruit and vegetables curtails the contingency of cardiovascular disease mortality by 15%. Even more than this, 4% of deaths due to heart diseases can be stopped by consuming more than 400 g of fruits and vegetables a day. If only fruits were consumed it did not make a significant reduction in risk, but when vegetable were consumed separately the risk factor was very much under control. Especially when vegetables are consumed raw, the risk of mortality was reduced by 16%. "With regard to cancer mortality, no statistically significant risk reduction was found, although it will be necessary to assess this according t specific types of cancer," Sanchez adds. 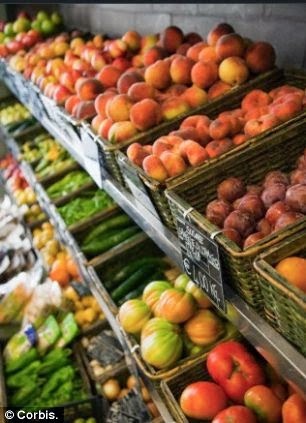 But she states that the fruit and vegetable consumption, is associated with reducing the risk of certain cancers like - colon and rectal, stomach, lung etc. Further study is expected to prove its link with reducing mortality due to tumors. The mortality risk reduction due to fruit and vegetable consumption was greater in those participants who consumed alcohol who were obese - 20%, and possibly" also in those who smoked. The reason behind this reduction is due to the high antioxidant content in the fruits and vegetables which mitigates the oxidation stress caused by alcohol, tobacco and obesity. "As such, these population groups in particular could benefit from the positive effects of fruit and vegetables in preventing chronic diseases and their associated mortality risk," Sanchez concludes.